A huge thank you to mytheresa.com for this awesome giveaway, and of course to all of you who took part in the competition! Stay tuned for more fun giveaways this spring! This entry was posted in Uncategorized and tagged Alexander Wang, fashion blog, Giveaway, mytheresa.com by Carolina Engman. Bookmark the permalink. 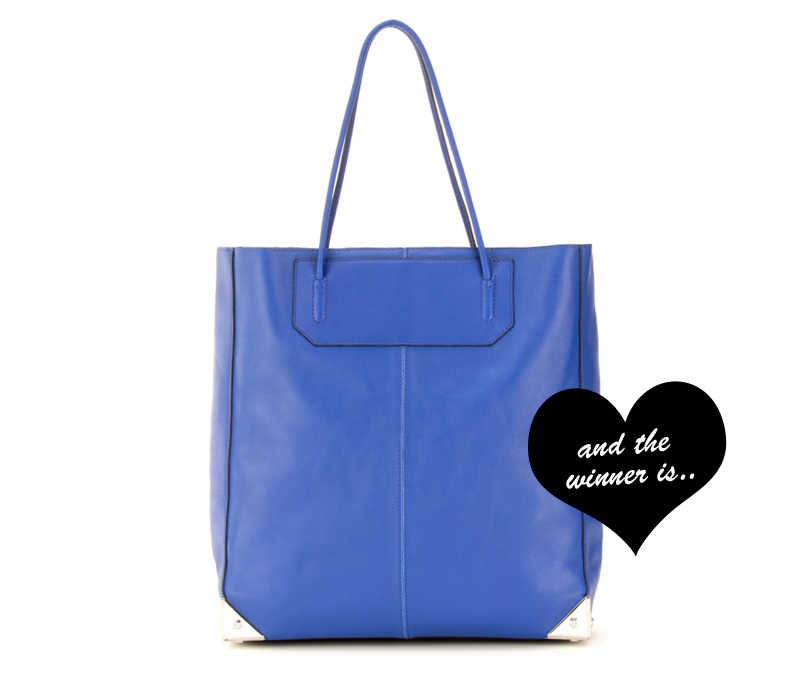 What a lovely bag … and a lucky girl! Wow, congratulations on the lucky winner! That is a fabulous blue bag!!!! Love the competitions you always do Carolina! Oh congrats to them. What a great gift to be receiving. congrats to her and thanks for the chance ! gorgeous color of blue for the bag . Lucky girl, the bag is great!! Congrats, it’s beauty, you will enjoy it. I didn’t apply for the giveaway but I like the bag, except handles, too thin. Congratulations !!!! I just can only dream of it !!!! So jelous of the winner. the bag is to die for. I have a little request, could you please hide the comments with our emials and facebook information on the original giveaway blog. I received many emails from some people who said that they got my email address from your blog. That bothers me very much. I think other people also have this problem. Hope you can understand. Thank you so much. BTW, this is a fantastic giveaway, and I love your blog so much! Wow, never knew such a sample program existed. You are a lucky duck to get to try out products. nice bag. I would love it more if it is light green.